Built-it-up app for ipad is the same kind of educational app for toddlers. The Build-it-up toddler’s app is a great tool for developing your child’s fine motor skills and visual perception skills as they touch and tap to play this interactive game. This iPad game also is a fun way to lay a foundation for early development of primary math concepts. This app is designed specifically for toddlers age 2.5 years and older. Built-it-up ipad game also helps develop primary math concepts such as size, top and bottom, before and after. What is the goal? The goal of the Built-it-up game for ipad tablet is to built up the part that will give to yo as correct as possible, one on the top of the other to create and complete the challenge. This game is one of a series of educational games for children by MyFirstApp.com. We believe that learning, playing, exploring and experimenting is what children do best. Children are fascinated with the wonderful, exciting world around them. With the touch pads revolution a whole new world of games is evolving – opening new horizons for the very young. Thus, young children can now enjoy colorful, exciting new games, helping them acquire new cognitive. 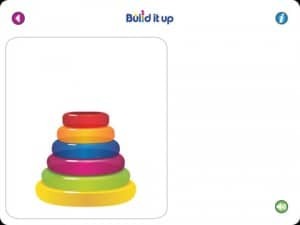 Built-it-up ipad game is available to download for free on the iTunes app store. So, don’t make your child wait.